Put the cream in a saucepan and heat gently over a low heat until the cream is bubbling, keep stirring whilst the cream is heating. Once bubbly and hot remove the cream from the heat and break the milk chocolate into squares. Add the chocolate into the cream and story until melted. Preheat the oven to 175c or gas mark 4. Grease and line 4x7 inch round cake tins. Put all of the ingredients for the cake except the hot water into a bowl and fold carefully until all of the ingredients are mixed. Add the the boiling water and with a hand whisk, mix until you have a smooth consistency. The cake batter will have a very runny consistency. So pour the mixture into a jug and divide evenly between the cake tins. Bake for 30 minutes or until a cocktail stick comes out clean. Then leave to cool. Once the cake has cooled use a small amount of the ganache (or buttercream) to stick to the base tier of the cake to the cake board. Spread the ganache on each layer of the cake using a palette knife and the cake together. Then spread a think amount of ganache on the outside of your cake, starting from the base and working up the cake. Chill for around 30 mins in the fridge to let it set. Then add another layer around the whole cake. Melt your chocolate for the drip, you can either do this in a microwave or using a bain-marie. Then leave to cool slightly for around 5 minutes. 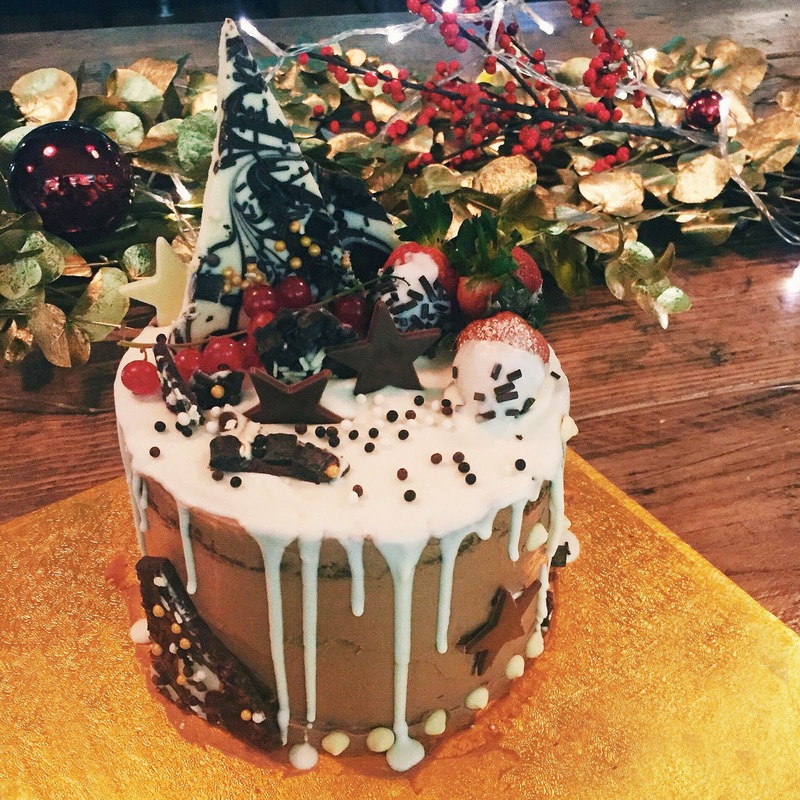 Pour the melted chocolate on top of your cake and using a palette knife spread over the top of the cake and push to the edges so it started to drip down your cake. Now it's time to decorate. If you're using making chocolate shards like I did add these now! You can decorate with anything you like, chocolate hearts or stars, sweets, sprinkles, berries, edible glitter, macarons, or even biscuits! I used the Dr.Oetker gold shimmer spray on my berries and I thought it added such a festive effect. Finally, share with friends and family on Christmas day. This looks so delicious and perfect for Christmas! This is looking so incredible !